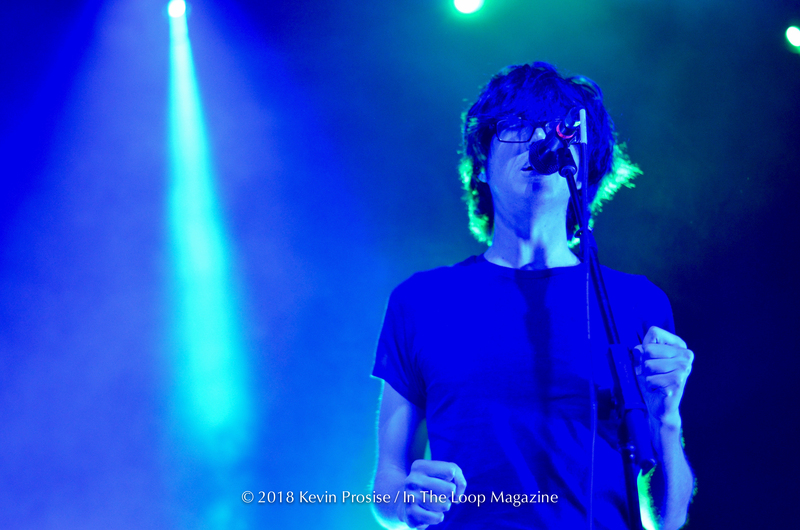 With the release of their re-recorded version of Twin Fantasy earlier this year, Car Seat Headrest landed in Chicago on Friday night to showcase the reworking of the indie-cult favorite and other hits from their catalog at the Riviera Theatre. Originally released in 2011, Twin Fantasy, is one of many albums released by Car Seat Headrest via bandcamp. Beginning as Will Toledo’s solo project in 2010, the band has since gone through some growing pains – some lineup changes, more album releases and eventually signing with Matador Records in 2015. They’ve since released Teens in Style (2015), Teens in Denial (2016) and the newly re-recorded Twin Fantasy (Face to Face) under the Matador Records moniker. The re-recorded Twin Fantasy (Face to Face) and the original Twin Fantasy (Mirror to Mirror) are the same album with two completely different feels to them. In an interview with KEXP, Toledo explained striping back the layers of obscurity in the lo-fi style of the original album, while attempting to make it a more personal record to him in 2018. Car Seat Headrest, consists of main songwriter/vocalist/guitarist, Will Toledo, Ethan Ives (guitarist), Andrew Katz (drums) and Seth Dalby (bass). However, for this tour they’ve added fellow tourmates, Naked Giants, to join in on the fun. Naked Giants, who are opening for Car Seat Headrest on this tour, include Grant Mullen (guitar/vocals), Gianni Aiello (bass/vocals) and Henry Lavallee (drums). When playing with Car Seat Headrest, Mullen is on guitar, vocals, Aiello on keyboards, vocals, guitar and Lavallee on auxiliary percussion. “Thanks for coming out early tonight guys. We have an early bedtime tonight,” says Toledo, as the stage lights turn on. Toledo referring to the 10:00 p.m. curfew time due to an all ages show. The now 7-piece, seemingly feel like they’ve been playing together for years as opposed to the months they’ve now performing together. The added vocal melodies, keyboards, guitars and auxiliary percussion, really fills out the sound of the band. With Toledo now solely on vocal duties, channeling his inner David Byrne, was seen dancing and twisting across the stage all night. They moved into a more folk-rock style, “Sober to Death/Powderfinger,” with the latter being a cover by Neil Young & Crazy Horse. This was a nice change of pace to the set, which complimented the more punk-rock, driving guitar chords sound that Car Seat Headrest does so well. “Don’t drink and drive,” belted out Toledo before going into fan favorite, “Drunk Drivers/Killer Whales.” The crowd erupted into a frenzy, screaming along to the chorus, showed how much control the band had over the room. However, it was when the band played, “Destroyed by Hippie Powers” that the crowd really turned it up to eleven. The crowd-surfers finally came out to play, with auxiliary percussionist, Henry Lavallee, running around the venue banging on the cowbell, which is featured in the song. The band seems confident as a 7-piece, and the performance showed. It will be interesting to see if the two bands decide to keep playing live together moving forward.